This latest edition of this treatise is now available for purchase. This treatise features state-specific chapters on ABCs (assignments for the benefit of creditors) and receiverships. Financial Poise™ announces the 2019 edition of Strategic Alternatives for and against Distressed Businesses. 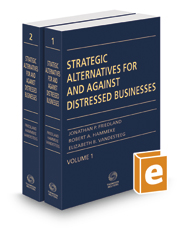 The 2019 edition of Strategic Alternatives For And Against Distressed Businesses was just released by Thomson West Publishing Company. This 1,800+ page treatise, which is the product of a collaboration between more than 100 contributors, is the only resource available which provides a state-by-state comparison, on a chapter-by-chapter basis, of assignments for the benefit of creditors and receiverships. DailyDAC / Financial Poise founder, Jonathan Friedland, a corporate structuring and restructuring attorney, is editor-in-chief. Mr. Friedland noted that, "Through the collective efforts of our many expert contributors, this treatise provides an up to date understanding of the options available to a distressed business and its creditors and constituents, both in and out of bankruptcy."